The national bird of Venezuela, the Venezuelan troupial is the largest troupial species and was once lumped into a single species with the orange-backed troupial and campo troupial. Today, each bird is recognized as beautiful and distinct. Markings: Genders are similar though males are slightly larger than females. The head is covered with a black hood, and the face shows a blue-gray eye ring of bare skin that extends to a point behind the eye. The nape and upper mantle are bright orange, creating a full orange collar around the neck that contrasts with the black back. The wings are black with a large white patch, and the rump is orange. The black hood extends down onto the breast, forming a jagged, zig-zag line where it contrasts with the orange underparts. The undertail coverts are paler yellow-orange. The eyes are pale, and the legs and feet are gray-black. Juveniles have similar markings but are paler, even yellowish, with a brown wash over the black parts of their plumage. The eye skin of young birds is also duller. These tropical birds prefer woodland habitats with lush, dense vegetation, including scrub areas and overgrown grasslands as well as fruit plantations. Venezuelan troupials adapt well to fragmented habitats and forest edges, but only up to 1,600 feet in elevation – they rarely venture higher in altitude. These birds are found in South America from northeastern Colombia through northern Venezuela, as well as on larger Caribbean islands, including Aruba, Curacao, Bonaire, Antigua, Grenada and Dominica. Venezuelan troupials have also been introduced to Puerto Rico and the Virgin Islands, both places where they thrive. These birds have a whistling, warbling song with 2-4 notes or phrases that may be repeated several times in a close sequence. They can be loud, particularly in areas where several troupials are singing to defend their territory. Venezuelan troupials are generally solitary or may be found in pairs, though they do join in small family groups after the breeding season. They can be aggressively territorial, particularly when nesting, and will vigorously chase intruders away from their nests. When foraging, they often stay on the ground seeking out fallen fruit, and when they sing, they perch in a high, visible spot. These troupials are monogamous and are nest pirates that usurp nests from different birds rather than building their own. They may be found in the nests of oropendolas, caciques, kiskadees, thornbirds or similar species, but they adapt each nest to their own needs by adding lining or enlarging the entrance. Venezuelan troupial eggs are pale whitish-pink with dark brown, black or gray spotting concentrated at the larger end. There are 3-4 eggs in a typical brood, and the female parent incubates the eggs for 14-16 days. After the altricial chicks hatch, both parents feed the youngsters for an additional 21-23 days, until the juvenile birds are able to leave the nest and begin foraging independently. A mated pair of Venezuelan troupials may raise 2-3 broods per year, with multiple broods more likely in areas where these birds have been parasitized by shiny cowbirds. These birds readily visit bird-friendly backyards, gardens and orchards in their range. Backyard birders can attract troupials by planting appropriate berry bushes or fruit trees to serve as food sources, and leaving windfall fruit in place for the birds to feed. Mango, soursop, papaya and date trees are particular favorites of Venezuelan troupials, and they may also visit large nectar feeders with sturdy perches. 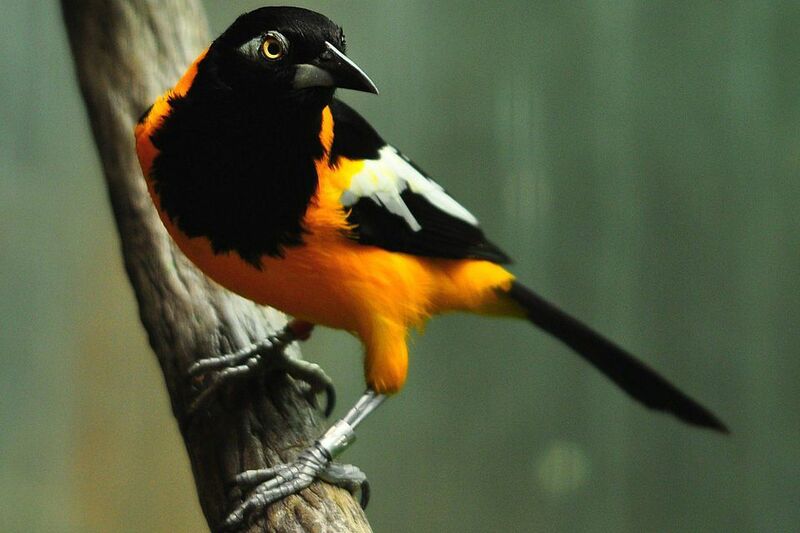 Birders who aren't able to visit the Venezuelan troupial's native range may be able to see these birds in captivity, as they are popular guests at zoos and aviaries. Because these birds are a source of national pride and patriotism in Venezuela, they are heavily protected in that country and are often a subject of avitourism. In some areas, however, these birds may be poached for the pet trade, which could be a threat to local populations. Overall, these birds are not considered threatened or endangered.